Re-Play Tableware: Review and Giveaway!! A few years back I did some extensive reading on the safety of plastic. X was getting to the age where plastic dishes would be super helpful, but are they safe? I learned that milk jugs are made from a safe plastic. It doesn’t leach chemicals or react with heat. 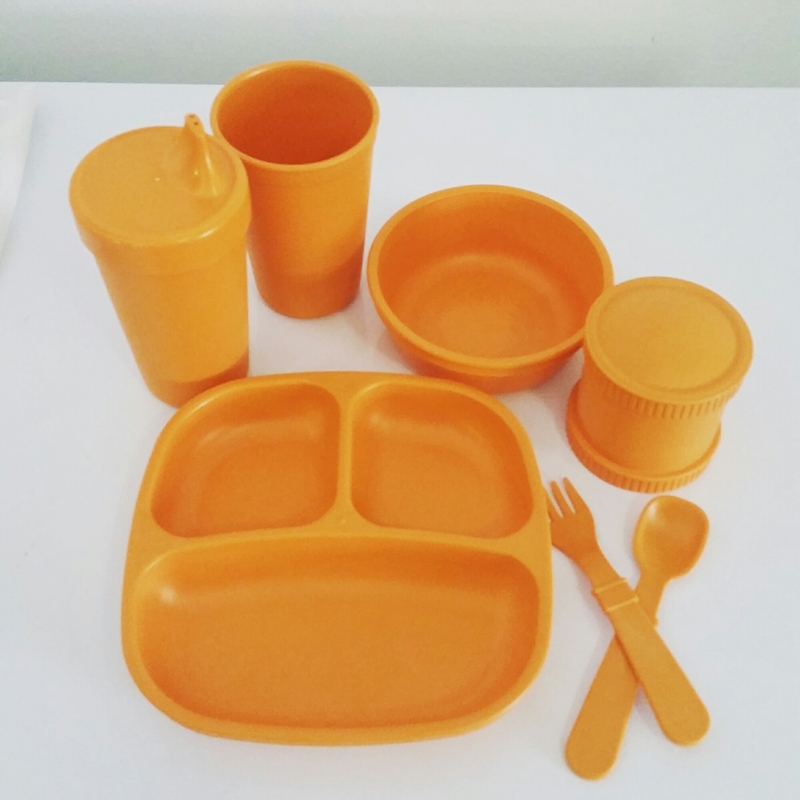 Flash forward to a couple of weeks ago and imagine how excited I was to find a company that makes children’s dishware from this safe plastic! I needed to get my hands on some! The great people at Re-Play sent me a whole set to review for you guys. But first I’d like to talk a little bit about the company. Re-Play collects and recycles milk jugs to create their awesome tableware. To date they have saved over 12,000,000 milk jugs from going into landfills! Their eco efforts don’t stop there. This family owned business keeps all aspects of their operation close together to reduce the total miles (and fuel) their products travel. This also means that they are an entirely USA based company! Their cardboard packing is also recycled and kept very minimal to reduce waste. 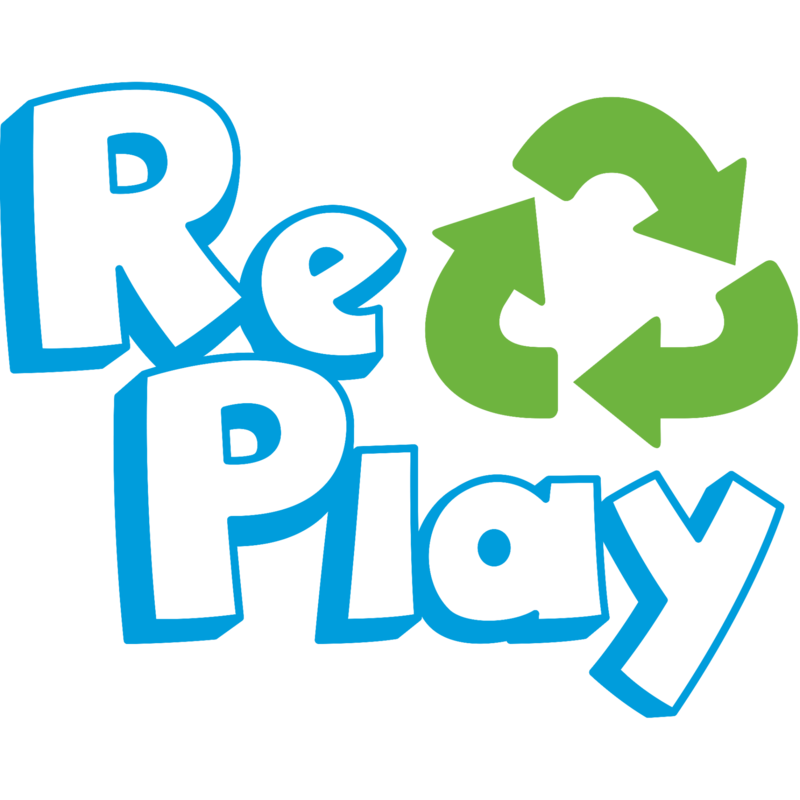 Re-Play strives to fulfill 5 Tenets of Responsibility: Sustainability, Affordability, Functionality, Durability and Safety. Safety is a huge factor for me and I was thrilled to see that not only do they source a safe plastic, they extensively test it to make sure only the best product is coming to their customers. This tableware is BPA, BPS, PVC, lead, phthalates and melamine free. In addition these products surpass FDA and EU purity standards. So now that you know what a great company they are, let’s talk about the tableware! 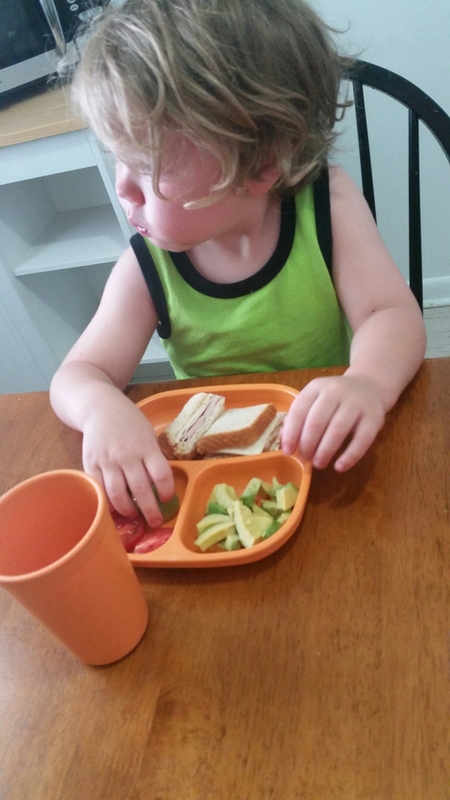 X has been asking for weeks for a divided plate. He doesn’t like his food to touch. I love the sizing on this divided plate. There’s plenty of room for his meal. The cups are well sized to fit in a child’s hand but hold a good amount of drink. The outside of the plastic is textured so it’s not slippery, but all food surfaces are smooth- which make them a breeze to clean! The bowl is deep enough for cereal or soup but just the right size for kids to handle. Honestly I was the most skeptical about the silverware. I haven’t met a plastic fork that actually works and most kids spoons are so flat that they’re useless. This was not the case! 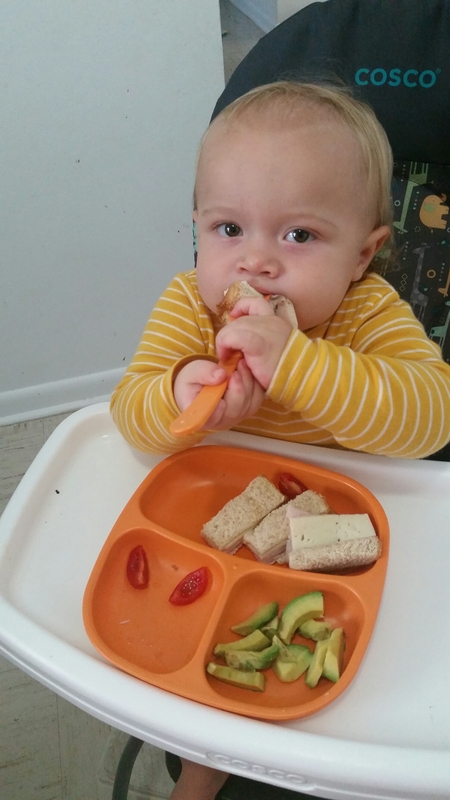 The fork is sized and shaped so well that even Q (who is 13 months old) can use it with ease. The spoon also has a generous dip, so food stays on it and makes it to their mouth! The sippy cup has proven to be leak proof despite the fact that Q likes to throw his cups once he’s done. It also has a small valve system with only 1 piece to remove for cleaning. This makes it super easy to keep clean and reassemble. Did I mention everything is dishwasher safe? With my husband deployed, dishwasher safe is a MUST for us right now. Possibly my favorite piece in the collection is the snack cup. It fits a good amount of food, but is small enough to throw in your purse or fit easily into a lunchbox. It’s so easy to use. X loves to fill it and screw on the cap before we head out on our adventures. I have a few exciting recipes I’m going to be posting soon featuring this great little cup! When they say Duribility, they’re not joking. There’s an amazing clip on their Instagram of a car running over the divided plate! The colors, oh my gosh, the colors. 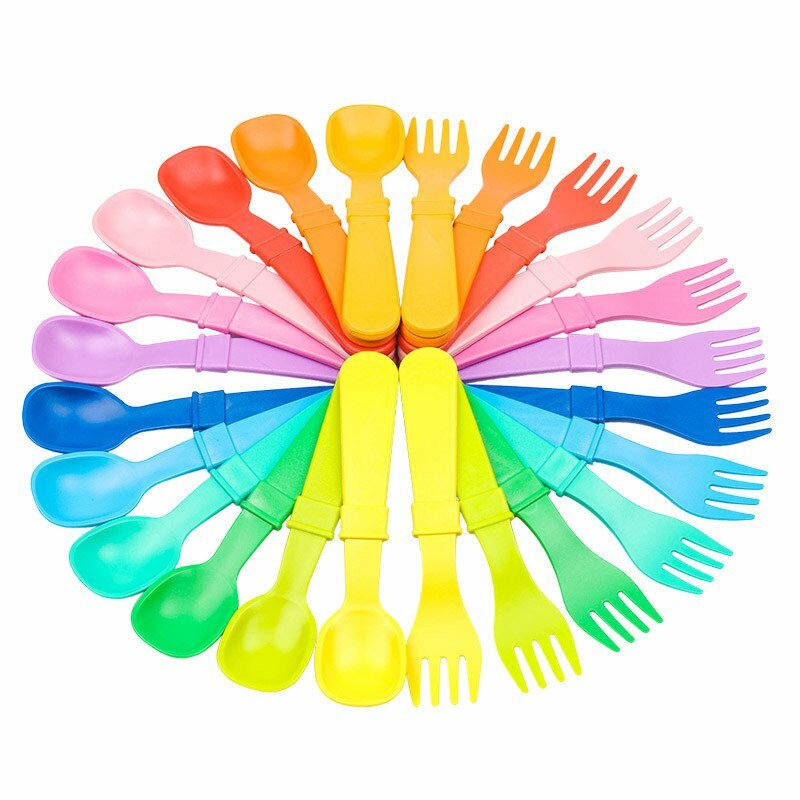 Re-Play tableware comes in a litteral rainbow of beautiful, bright colors. I also love that you can buy a single plate, a set of tableware or a whole stack of bowls. They make shopping easy and give lots of options. To receive 15% off a purchase of $20 or more this week!! They also have a lot of great deals happening right now and just released there featured color for August which is a fun lime green! You can purchase through their website, Target, Walmart and even Amazon. Their quality is above and beyond their great price point and they have amazing ethics to match. You can keep up with Re-Play and all of their fun by following the links to their Facebook page, Instagram, Twitter and Pinterest. While at the farmer’s market last week I discovered a 3 lb bag of “seconds” carrots (ie: ugly carrots) at my favorite organic stand, for a discounted price. I snatched them up, knowing they were destined for baby food. I baked some and steamed most. I wanted to provide a variety of flavor and texture. My first steamed batch I used the food processor which made a “chunky” more grainy texture. Which will Probably be good once he gets used to eating, but not so much right when he starts off. 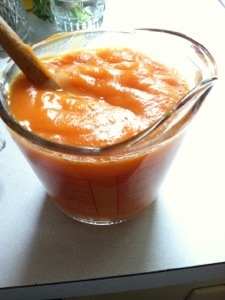 The next steamed batch I put in the blender, which created the smooth, classic baby food texture. The baked carrots I put through the food processor as they’d been baked in olive oil and I planned to use them further along in his culinary adventures. I froze everything in my Tovolo silicone ice cube trays, which make perfect 1 ounce cubes and stored them in well labeled freezer bags. -I need more then 2 cube trays. It took the baby food much longer to freeze then I expected. I shall be ordering more from amazon soon. 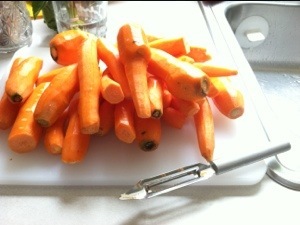 -when steaming veggies, don’t let the pot run out of water. It smells and makes a horrible mess of the pot. Tomorrow I’m hoping to scout out some organic peaches as they’re in season. I’m going to have a freezer full before baby X even starts eating!